Fun never gets too big -- even for the smallest child to join in -- when Barney is there to help show the way! Everyone’s favorite purple T-rex and all his friends learn important preschool milestones in Barney I Can Do It!, coming to DVD, Digital Download and On Demand May 17, 2011 from Lionsgate and HIT Entertainment. In this fully-loaded program, Barney and his friends show that there are new things for kids of any age to learn each day such as brushing your teeth, tying your shoes and cleaning your room. Trusted by moms and adored by children, Barney displays sharing, caring, imagining, dancing and learning on television, online and through live events, home entertainment and publishing. The Emmy® award-winning series, Barney & Friends is one of the top-rated preschool shows today, airing on PBS KIDS and Sprout. Are you ready for big-kid fun?Join BJ, Claire and Jadeas Barney teaches them that even if you're not big enough to do all the things your friends are doing, there are new friends to meet and new games to play right now. Discover that big-sized fun is waiting for you every morning, and every day you grow is loaded with Tee-riffic adventures! One lucky winner will receive a copy of Barney: I Can Do It !! 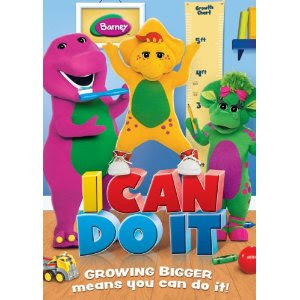 *Follow me @jamaise at Twitter & Tweet this : RT @jamaise #GIVEAWAY #WIN Barney: I Can Do It ~ DVD ~ GIVEAWAY!!! ~ http://bit.ly/iBLBS9 Ends 5/30 tweet each day for one entry each ! I have like 5 entries <3 it's just to hard to keep posting from my phone ): my 3 year old baby girl Haedyn loves Barney! I would love to win this for her! my daughter woud love this! My best friends son would love this and I follow via GFC! My three year old would love this! My daugther would enjoy it.